The Month of June - Elegant Retreat! 6/1-7/12 - Any 30 nights $3999! Elegant Retreat is quite possibly the nicest vacation rental in Prescott! 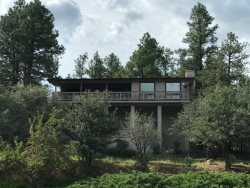 This beautiful property sits right on the golf course and is just 15 minutes north of downtown Prescott. Every feature in this special home is unique and exquisite. Artfully decorated and wonderfully furnished Elegant Retreat is your home away from home for the month of June. There are 2 bedrooms with a king in the master and a queen in the second, sleeping 4 guests comfortably. Each bedroom has its own in-suite bath. The master bath, with cool blues and greens, has a beautiful double shower and walk-in closet. The second bathroom is complete with shower/tub combination. The open, light living room has interesting art work, and a state-of-the-art entertainment system. This property is equipped with Apple TV. Apple TV gives you access to tons of great HD content. Enjoy blockbuster movies, TV shows, live sports and news, your music, photos, and more right on the high-definition TV. You can even play content from your iOS devices or Mac on your TV using AirPlay. Elegant Retreat has a large kitchen with all of the necessities to create gourmet meals or simple snacks. You can enjoy your creations at the dining table with beautiful views of the mountains and golf course. A large slider brings you out to the spectacular back yard. This is where you will be spending most of your time enjoying Prescotts mild daytime temperatures and cool summer evenings! From your first cup of coffee in the morning to your glass of wine with dinner it is a space to relax and enjoy. Everything is there for entertaining. You have an outdoor gas fireplace, comfortable table and chairs and a supreme BBQ gas grill. There is even a beautiful fish pond with large koi to keep you entertained. Elegant Retreat has a garage with space for two cars. Washer/dryer, dish washer and internet are included in this modern home. If you are looking for a monthly rental in June there is nothing that compares!